Ever since before Easter I have had my eye on this yummy-looking macaroni and ham bake in the March Cooking Light magazine (page 204 if you're interested). I was all prepped and ready to go last Tuesday, but my sister and her husband took off for Ohio to look for a new house (they are moving in May) and my other roommate was at home in Puerto Rico for her spring break. I was not about to bake a huge casserole for little ol' me. No way no how am I ever going to bake a casserole for me to eat day after day, for lunch and dinner. I just can't handle it. So I didn't make it. I made my lovely twist-on-a-Hot-Brown instead. Which worked just as well. 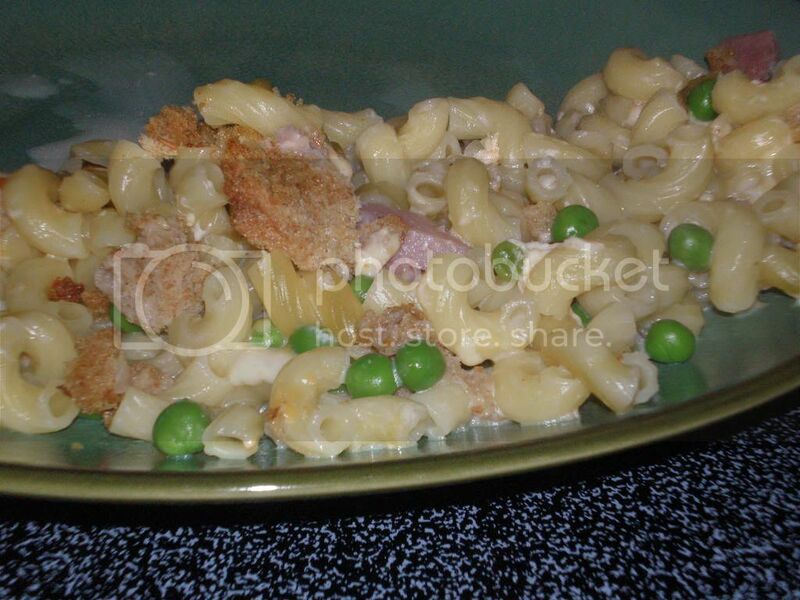 So about this casserole -- I mean, Ham and Cheese Macaroni Bake with Peas. It looked very appetizing in the picture, hence why I wanted to make it, but it didn't quite turn out how I thought it would. First off, I scoured the cheese bin, looking for a block of Swiss and I accidentally picked up the "Light" Swiss cheese. Everything was going just fine and dandy while putting together this recipe. Then enter the cheese. After hastily shredding my 2 cups of cheese, I shook it into the pan with the simmering milk mixture, and it completely globbed up on me. Even after lots of stirring. 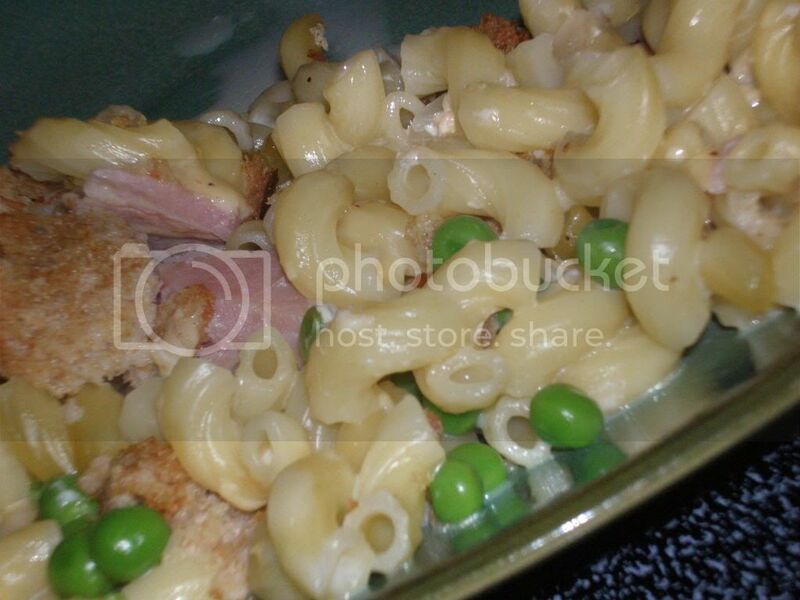 I mixed the clumpy sauce into the noodles, peas, and ham and then tossed it in the oven, hoping some heat would help the issue. I was wrong. It was still clumpy when we were eating it, not all melty and gooey as I had hoped. However, I will say, even with all the cheese globs, it was still pretty tasty -- three of us polished half of it off. I really liked the extra flavor the red pepper gave. So maybe next time I will try the "regular, full-fat" Swiss cheese, and I will have normal looking macaroni bake. Cook pasta in boiling water 6 minutes. Drain and rinse with cold water; drain. 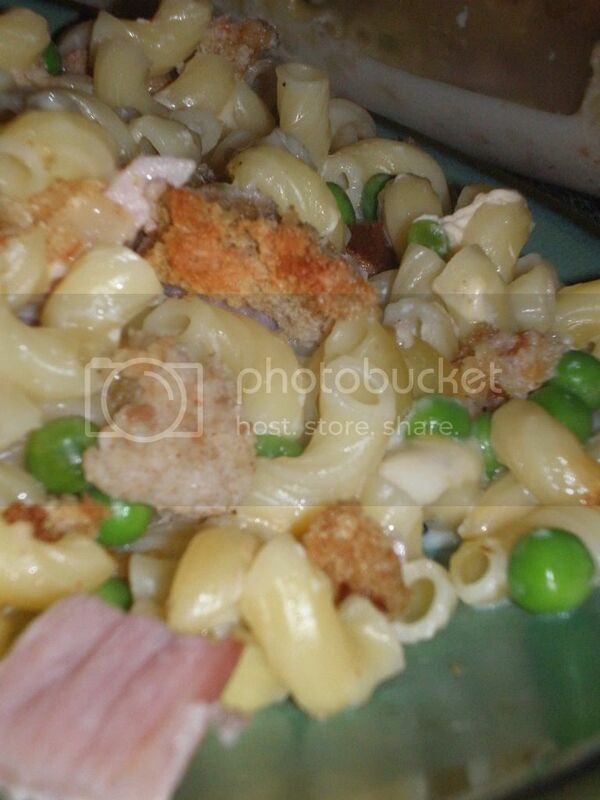 Combine pasta, ham, and peas in a large bowl. Heat a medium saucepan over medium heat. Coat pan with cooking spray. Add onion to pan; cook 4 minutes, stirring frequently. Add milk; bring to simmer. Remove from heat; stir in cheeses, salt, and peppers. Pour cheese mixture over pasta mixture; stir to coat. Spoon pasta mixture into a 13x9-inch baking dish coated with cooking spray. Place bread in a food prcessor; pulse 10 times or until coarse crumbs measure 1 1/4 cups. Combine breadcrumbs and butter in a bowl. 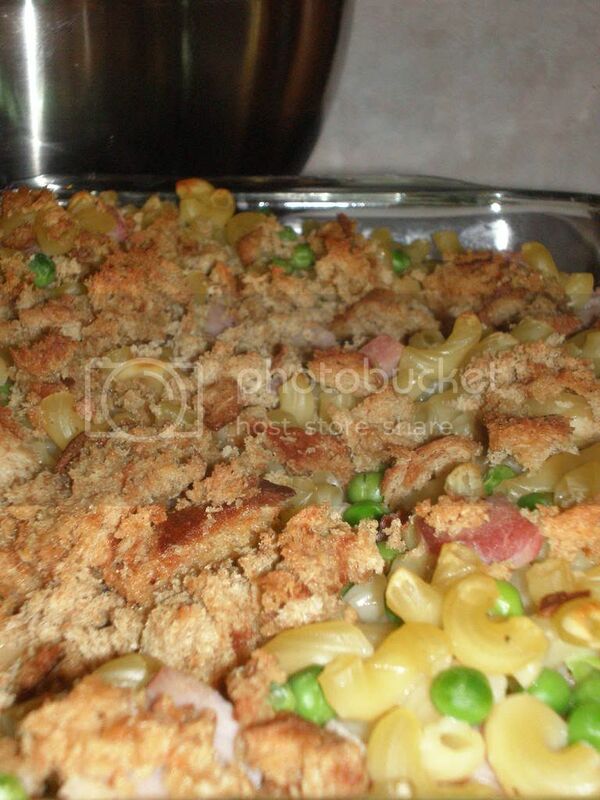 Arrange breadcrumb mixture evenly over pasta mixture. Bake at 400 for 20 minutes or until lightly browned. Use the white bread -- I used wheat and it had a pretty distinctive taste. I used regular cheddar and "light" skim, as well as fat free milk. Chalk whichever one you want up to clumpy cheese.